Place For Your Stuff: St. Albert Storage | ProNorth Industrial Park Inc. Pro North Industrial Park Inc. is situated on the south edge of Sturgeon County only five minutes from St. Albert. Current tenants in ProNorth Industrial Park include aviation operations, storage and warehousing, log home/modular building manufacturing, welding, machining and fabricating, and heavy equipment. 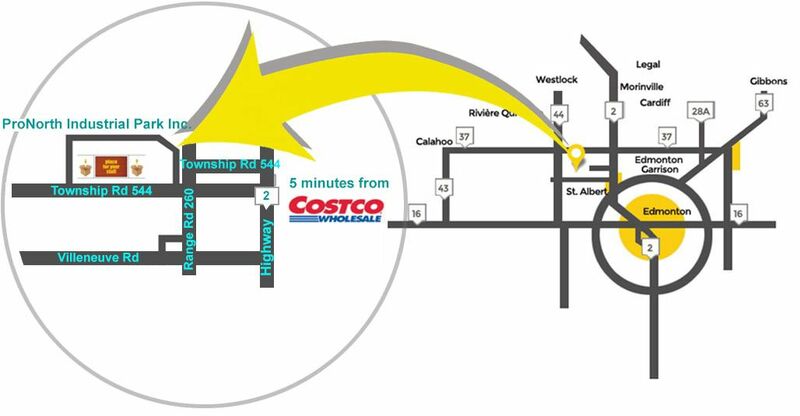 When you turn left onto Elliot St (St. Albert RV, Inc, Snubbertech), Place For Your Stuff is on the right. Place For Your Stuff self storage facility is located at 50 Elliot Street, Sturgeon County, Alberta, with direct access to Hwy 2. Situated 10 minutes South of Morinville, 15 minutes West of the Garrison Military Base, and 30 minutes Northwest of Downtown Edmonton.